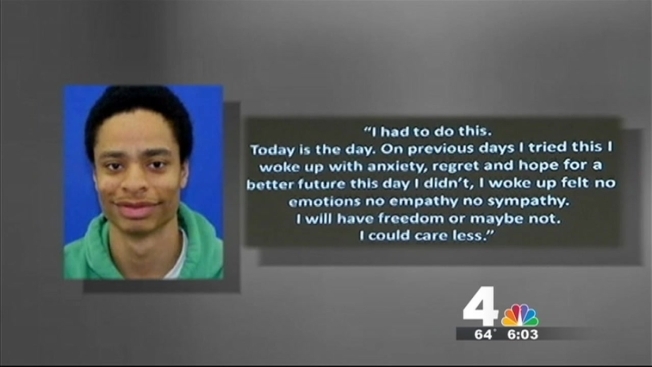 The young man who shot and killed two people he did not know in a Columbia, Md. mall in January was fascinated by the Columbine shooting, even timing his attack for the minute the Columbine shooting began, police said. Darion Marcus Aguilar dressed like the Columbine shooters, and, after assembling a shotgun inside the dressing room of Zumiez in the Mall in Columbia on Jan. 25, he took a photo of himself. He posted it to Tumblr just before he stepped out of the dressing room and killed two people. "I had to do this. Today is the day," the post on the social-media site read. "On previous days I tried this I woke up with anxiety, regret and hope for a better future this day I didn't, I woke up felt no emotions no empathy no sympathy." Howard County Police Chief William J. McMahon held a news conference to share details about the Jan. 25 Columbia Mall shooting. Howard County police detailed Aguilar's fascination with the Columbine shooting -- as well as his desire to find treatment for mental illness -- during a press conference Wednesday. On Jan. 25, Aguilar, 19, entered the Zumiez store on the upper level of the mall and fatally shot two employees, 21-year-old Brianna Benlolo and 25-year-old Tyler Johnson, before turning his shotgun on himself. Police say there's no connection between Aguilar and the victims. Aguilar had no criminal record before the shooting. But a search of Aguilar's computer revealed thousands of searches for mass shootings at schools and malls. A Tumblr account belonging to Aguilar featured hundreds of pictures of shootings and other disturbing images. Aguilar also downloaded a game based on the Columbine shooting. News4's Derrick Ward visits the Columbia Mall and reports on the growing memorials for the victims of that shooting. According to police, the timing of the shooting -- 11:14 a.m.-- was tied to the timing of the Columbine shooting. On April 20, 1999, Eric Harris and Dylan Klebold, seniors at Columbine High School in Littleton, Colo., opened fired in the school's cafeteria after trying to detonate propane bombs. The armed paired killed 12 students and a teacher before killing themselves. According to investigators, Aguilar visited a doctor in April 2013 and told the doctor he was hearing voices. He was referred to a psychiatrist, but there's no record that he ever made an appointment. The disturbing computer searches continued in the months leading up to the shooting; Aguilar also visited suicide chat rooms and researched mental health issues. In December, Aguilar purchased a single-barrel shotgun at United Gun Shop, along with a box of bucketshot (large and lethal) and birdshot (small and round) ammunition. The shotgun could be broken down into several pieces, making it easy to transport. Police say Aguilar carried the broken down shotgun in a backpack and assembled it in a dressing room inside Zumiez. In the seconds before the shooting, Aguilar took a picture of himself and uploaded it to Tumblr. 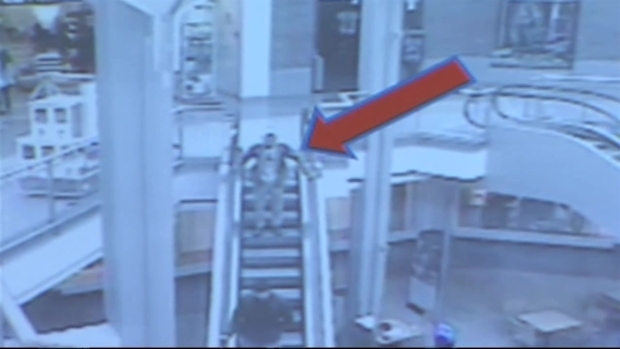 Police say Aguilar was dressed like one of the Columbine shooters in the picture. Howard County Police Chief William McMahon said they would not be releasing the picture as they believe Aguilar took it in order to gain notoriety following the deadly shooting. 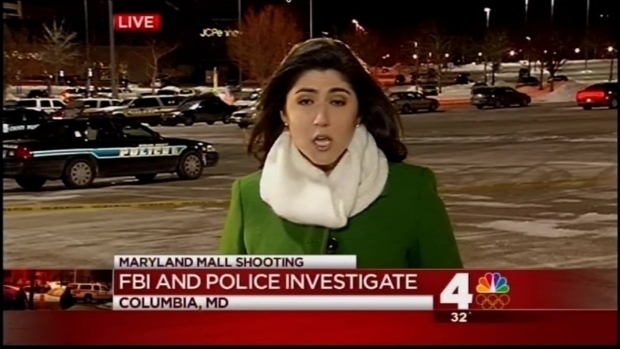 News4's Erika Gonzalez is live in Columbia at the mall where an unnamed guman entered a Zumiez clothing store and opened fire, killing two employees before turning the gun on himself. Two homemade explosives were also found inside the bag left in the dressing room. About two-and-a-half hours after the fatal shooting, Aguilar’s mother reported him missing; no connection to the shooting was known at that time. The search for Aguilar escalated after his mother showed officers his journal. According to police, Aguilar had expressed the desire for help from a mental health professional in a journal they found at his home. In his writings, Aguilar went on to describe thoughts of wanting to die, kill others and expressed a general hatred of others, police said. A chilling excerpt from the journal was shown at Wednesday's news conference. Police said Aguilar also expressed that he was sorry for "what he was about to do." Detectives eventually tracked Aguilar’s cellphone signal to Columbia Mall. News4's Erika Gonzalez spoke exclusively with a family friend of Darion Aguilar, the man accused of shooting and killing two people last month at the Columbia Mall. 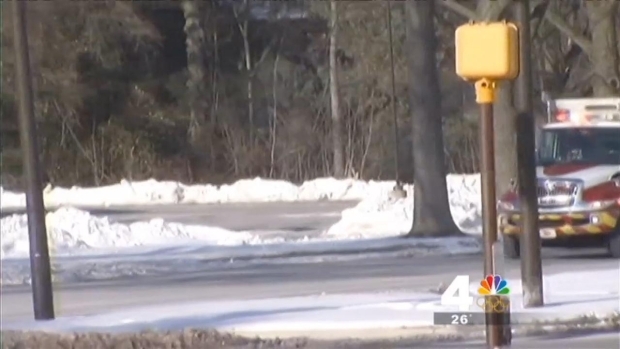 "It’s soon learned that our missing person and the gunman were one in the same," said Julie Parker of Prince George’s County police. The investigation is continuing, Howard County police said.